If you didn’t receive my recent newsletter on the benefits of making and drinking herbal cordials, I hope you sign up soon here on my website. When I’m on top of things, you’ll get your free newsletter twice a month. 😉 If you’re new to my blog (shorter and often more irreverent than my newsletter), click on the little orange icon to get my updates. This recipe comes via Theresa Boardwine and her fabulous medicine-making classes in North Carolina. 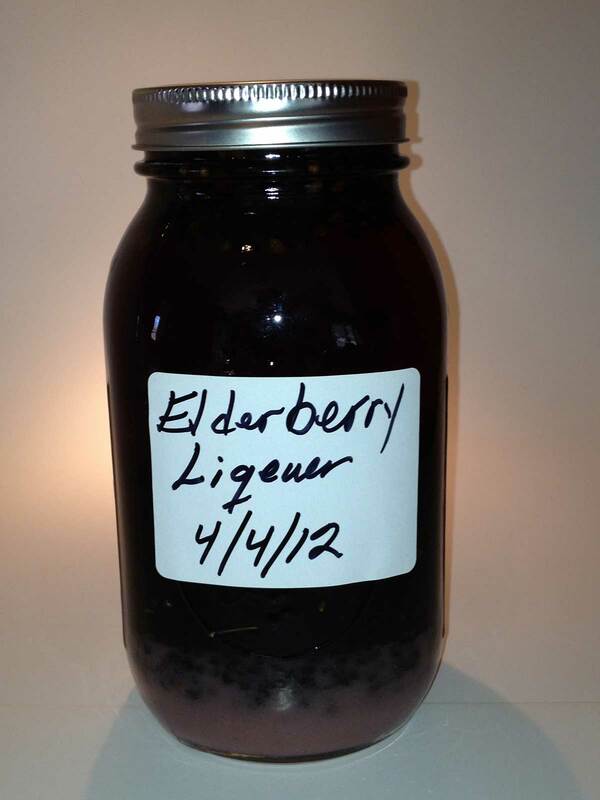 You can choose any herbs or fruit you like; elderberry is the classic for helping to strengthen immune function and it tastes delicious! Place your herbs and any dried fruit you might want in this beverage into a clean, glass jar until it’s 1/4 to 1/2 full. Pour vodka or brandy over the plant matter, making sure it is completely covered with the liquid. Depending on the plant(s), I usually add an extra inch of vodka (my preference) to allow for the expansion of the plant material. Notice if you need to add a bit more the next day to keep the plant material covered. Date and label your jar. Let this steep for about 1 month in a cool, dark place, gently shaking the jar daily. Energetically speaking, it’s fun to begin your tincturing process on the new moon and press it out the next new moon. The new moon is the beginning of a cycle, time to start fresh projects and tinctures! After a month, strain the liquid from the plant material which can be added to a compost. Add one of several sweetening options to the tincture: real maple syrup, honey, blackstrap molasses or sugar. Add ¼ to ½ cup sweetener per one quart of tincture. Pour your emerging liqueur into a pretty bottle and label. Adding more dried fruit will make it pretty, colorful and a little sweeter. Choose dried apricots, dates, jujube dates, raisins, dried ginger or mango, depending upon the recipe. Just like tinctures, alcohol has been used as a solvent to break down the cellular walls of the berries and fruits which provides us with greater nutrients and enhances the color of your cordial. This extraction is then stable at room temperature and will maintain its potency up to five years. Get creative with using cordials as part of your dessert–or sip it delightfully on its own!